The first view of the garden: mighty oaks surrounded by smaller shrubs and bushes at the end of a path covered in grass and mosses; a distant lake beyond, shimmering blue, grey or silver, depending on the angle of the light; to the fore, a ton-weight steel sculpture with a narrow passage cut diagonally into the wedge-shaped section which tapers towards the viewer. This first scene is already like a summary of the garden. It appears to be “different” and yet seems to have existed forever. Groups of native trees and bushes can be found alongside magnificent old trees which appear to have stood here since time immemorial and which surround and divide up the extensive terrain. 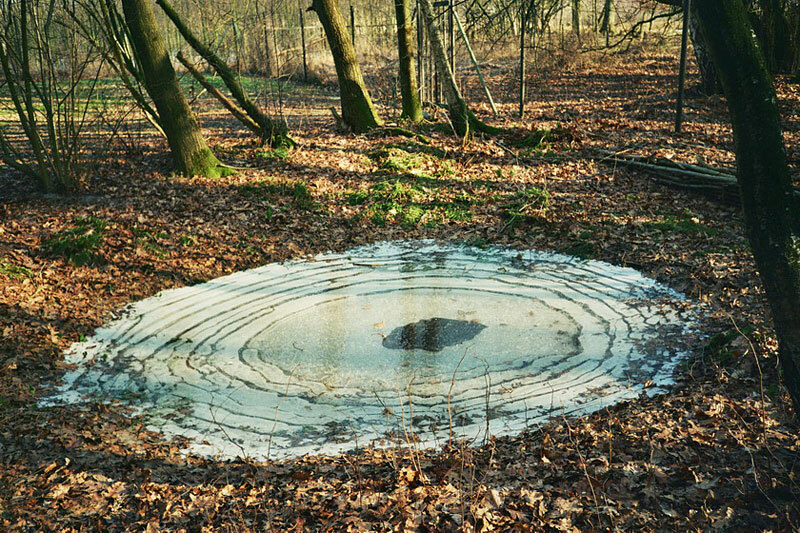 The large sculptures, some of which are walk-in pieces, make the confrontation between art and nature stark and unavoidable. This is also true of this sculpture, the upward diagonal slope of its dark passage seemingly continuing into the trunk of the oak tree and thus drawing the visitor’s gaze into the mysterious world of the tree’s gnarled spreading crown. And yet the visitor experiences this garden as a wonderful whole: nature and sculptures not only enhance each other powerfully but also enter into a symbiotic relationship, making it a magical place. The Sculpture Garden created by artist Wilfried Hagebölling is located at the edge of the town of Paderborn in the Senne. The Senne – a heathland landscape on the southern slopes of Teutoburger Wald – lies at the heart of an extensive nature reserve/area of special conservation directly adjoined by small areas of woodland, a lake and large sandy stretches of open land with dunes and shallow areas of water. 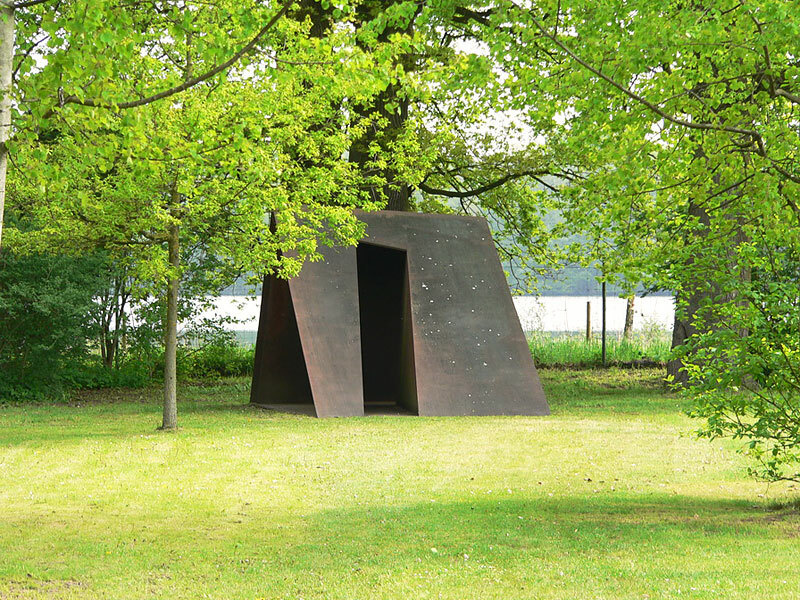 Hagebölling is above all known for his large steel sculptures in public spaces, i.e. in urban spaces normally defined by their architectural context. 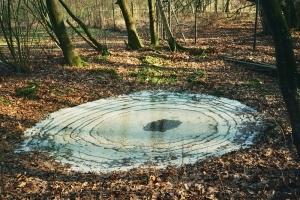 Here, however, a large number of his works can be seen in completely different surroundings, in a natural environment characterised by landscape. This is Hagebölling’s own garden, especially created for his sculptures – and even more so by them. In 2001, the sculptor began developing his sculpture garden in the grounds of a former farmstead surrounded by old bushes and trees. Located in Altensenne and mentioned in documents as early as 1672, this farmstead is among the oldest farms in the Senne. The mighty oaks are over 300 years old and date back to the period when the Senne was settled and cleared for cultivation after the Thirty Years War. The overgrown grounds, which had been unused for many years and which now include a small “copse”, were redesigned extensively in Hagebölling’s concept. The artist divided the grounds into large areas and more intimate spaces by making just two broad, firm paths while also re-modelling the terrain, creating sweeping areas of grass and additionally planting native shrubs and trees. He consciously refrained from any strict layout of paths, from any order based on architectural principles and from any rich display of colour or flowers. All the changes made were aimed at creating various different spaces while simultaneously designing the garden to appear as natural as possible, thereby not least enabling it to fit harmoniously into its surroundings while also offering views of them. The garden does not make any specific prescriptions for the viewer nor does it reveal itself through any plan of paths. Instead, it lends itself to gradual, unforced discovery, encouraging the viewer to stroll, move on and look back again. The “points of destination” – if that is the right term – are the sculptures, which repeatedly attract and draw the viewer on. This is because the garden’s special quality – what makes it different – is what might be called the “second cultivation” of the area, its cultivation by art following the cultivation of the Senne. Walk-in steel sculptures, whose large and clear planar forms contrast beautifully with the less clearly defined masses of foliage or networks of branches and whose rust-orange-brown colours provide a an attractive contrast to the wide variety of shades of green, entice the visitor into their interiors, shutting out the surroundings and revealing nothing but the sky and the tops of distant trees or framed views of the garden through their entrances and exits. Weighty sheets of steel place themselves between groups of trees, thereby creating new and completely different spaces. Sculptures can be found throughout the garden and repeatedly act as structural elements. A network of lines of sight, visual points and directions link the sculptures to each other and to their surroundings. Perspectives continue out into the landscape or to the adjoining lake, lose themselves in the shade of the wood or come to rest in clearings. Directions become condensed within the sculptures, the interiors of which become places of self-knowledge, sanctuary and inner contemplation. Visitors exploring the garden are surprised time and again by hidden works – some of them in stone or concrete – in clearings or in out-of-the-way places. With all senses wide awake and heightened by a large number of impressions, the visitor become sensitive to the seemingly nondescript, to radiant carpets of lesser celandine, charming mosses and lichens on stone sculptures, and to the fresh green of ferns in the shimmering light of the copse. The lush profusion of all areas of the garden has increased with time, making their special atmosphere a sensual experience and casting a spell of enchantment over the visitor. The combination of art and nature is a long-held dream. Wilfried Hagebölling has realised this dream in his sculpture garden, where art and a piece of nature have grown together to form a whole. When walking around and spending time here, the viewer gets an increasing sense of how these sculptures are an inseparable part of the garden, not only defining it but also giving rise to something new and distinct which emerges from the combination of natural surroundings, sculpture, nature and art – a magical place which is both mysterious and open. Contact: Monika Hoffmann, Tel. 0049-5251-25255. Guided tours for groups by request, Tel. 0049-5251-25255.